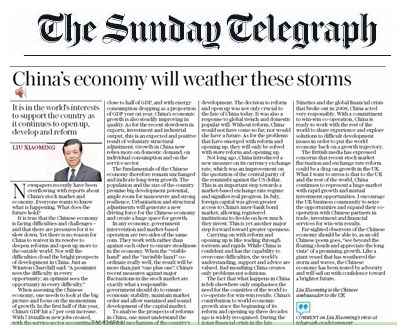 Newspapers recently have been overflowing with reports about China's stock market and economy. Everyone wants to know what is happening. What does the future hold? It is true that the Chinese economy is facing difficulties and challenges – and that there are pressures for it to slow down. Yet there is no reason for China to waiver in its resolve to deepen reforms and open up more to the outside world. Nor will the difficulties cloud the bright prospects of development in China. Just as Winston Churchill said: "A pessimist sees the difficulty in every opportunity; an optimist sees the opportunity in every difficulty." When assessing the Chinese economy, one needs to look at the big picture and focus on the momentum of growth. In the first half of this year, China's GDP hit a 7 per cent increase. With 7.18 million new jobs created, with the service sector accounting for close to half of GDP, and with energy consumption dropping as a proportion of GDP year on year, China's economic growth is also steadily improving in quality. As for the recent slowdown in exports, investment and industrial output, this is an expected and positive result of voluntary structural adjustment. Growth in China now relies more on domestic demand, on individual consumption and on the service sector. The fundamentals of the Chinese economy therefore remain unchanged and indicate long-term growth. The population and the size of the country promise big development potential, ample room for manoeuvre and strong resilience. Urbanisation and structural adjustments will generate a new driving force for the Chinese economy and create a huge space for growth. In any economy, government intervention and market-based operation are two sides of the same coin. They work with rather than against each other to ensure steadiness in the economy. When the "visible hand" and the "invisible hand" co-ordinate really well, the result will be more than just "one plus one". China's recent measures against major fluctuations in the stock market are exactly what a responsible government should do to ensure economic stability, maintain market order and allow sustained and sound development of the capital market. To analyse the prospects of reforms in China, one must understand the internal mechanism of the country's development. The decision to reform and open up was not only crucial to the fate of China today. It was also a response to global trends and domestic popular will. Without reform, China would not have come so far; nor would she have a future. As for the problems that have emerged with reform and opening up, they will only be solved with more reform and opening up. Not long ago, China introduced a new measure on its currency exchange rate, which was an improvement on the quotation of the central parity of the renminbi against the US dollar. This is an important step towards a market-based exchange rate regime and signifies real progress. In July, foreign capital was given greater access to China's inter-bank bond market, allowing registered institutions to decide on how much they invest. This is yet another major step forward toward greater openness. Carrying on with reform and opening up is like wading through torrents and rapids. While China is confident and has the capability to overcome difficulties, the world's understanding, support and advice are valued. 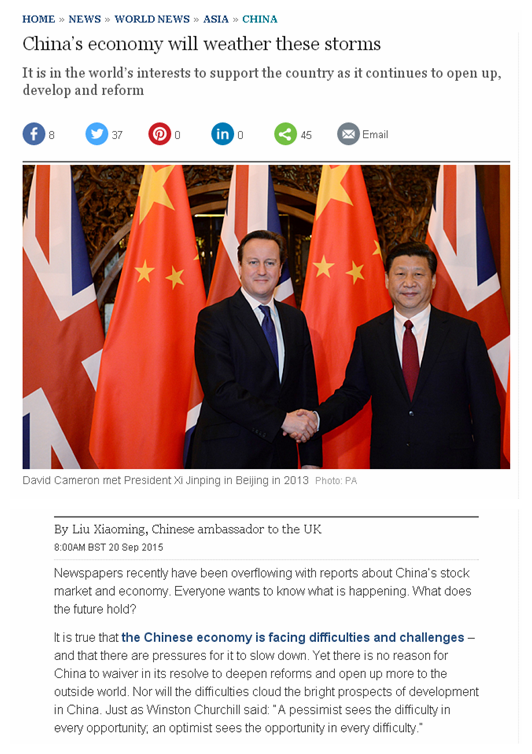 Bad-mouthing China creates only problems not solutions. The fact that what happens in China is felt elsewhere only emphasises the need for the countries of the world to co-operate for win-win results. China's contribution to world economic growth since the beginning of its reform and opening up three decades ago is widely recognised. During the Asian financial crisis in the late Nineties and the global financial crisis that broke out in 2008, China acted very responsibly. With a commitment to win-win co-operation, China is ready to work with the rest of the world to share experience and explore solutions to difficult development issues in order to put the world economy back on a growth trajectory. The British media has expressed concerns that recent stock market fluctuation and exchange rate reform could be a drag on growth in the UK. What I want to stress is that to the UK and the rest of the world, China continues to represent a huge market with rapid growth and mutual investment opportunities. I encourage the UK business community to seize the opportunities and expand their co-operation with Chinese partners in trade, investment and financial services for win-win results. Far-sighted observers of the Chinese economy should be able to, as an old Chinese poem goes, "see beyond the floating clouds and appreciate the long vista" of a promising growth. Like a giant vessel that has weathered the storm and waves, the Chinese economy has been tested by adversity and will sail on with confidence toward a brighter future.